Podocarpus macrophyllus Japanese Yew, Plum Yew, Buddhist Pine. Perhaps no other exotic tree has made itself more at home in the forests of Jungle Gardens than Podocarpus macrophyllus the Plum Yew. Also known as Buddhist pine, this conifer is native to mountainous areas of eastern China and southern Japan and is the northernmost member of the genus, which has over 100 species. The Plum Yew is commonly cultivated throughout the southern US but rarely has it been reported as naturalized. In Jungle Gardens there is no wooded area that has not been colonized by Podocarpus. In some locations it is the dominant understory plant. When growing naturally under the canopy of much taller trees, this conifer assumes a completely different growth habit from cultivated plants that are usually growing in full sun. Naturally shaded Podocarps are tall, elegant, spectacular trees. Since Podocarpus seeds have a colorful, edible, fleshy appendage, they are unquestionably animal-dispersed. These seeds germinate readily. Often numerous seedlings can be found in the vicinity of mature trees. Because Podocarpus is evergreen and does not seasonally shed its leaves, trees retain leaves for many years. The humid conditions of Jungle Gardens give rise to proliferous epiphyllous growth of lichens and liverworts on foliage of many evergreen trees. 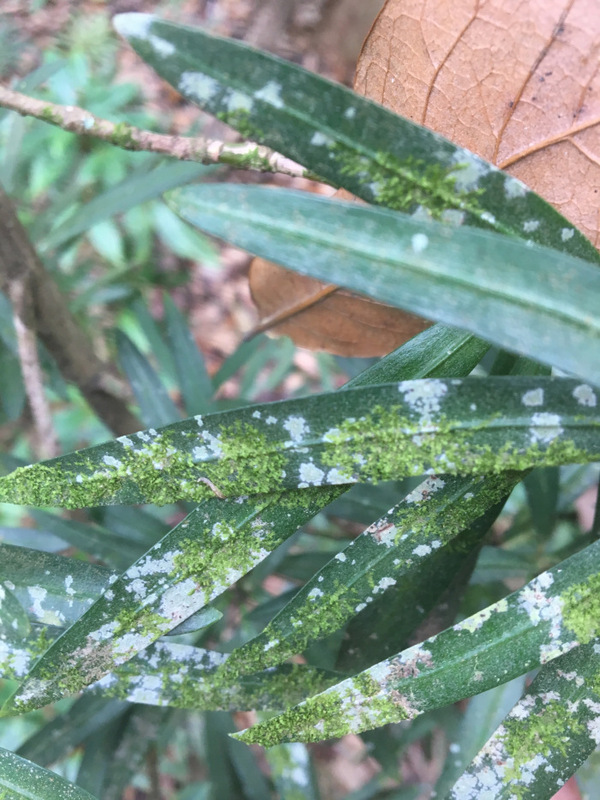 Both lichens and liverworts are slow-growing organisms, their abundance on the leaves of some Podocarpus is a testament to the incredible longevity of those leaves. In Jungle Gardens there exists a great diversity in the appearances of Podocarpus trees. The most pronounced differences are in leaf length and color of newly emerging leaves. There are trees on which all leaves are very small, only 1.5 inches long, and others whose leaves are 5 and 6 inches long. These differences are so pronounced as to suggest the trees could be different species. However, authorities who have visited the gardens and viewed the plants have assured me all are Podocarpus macrophyllus. 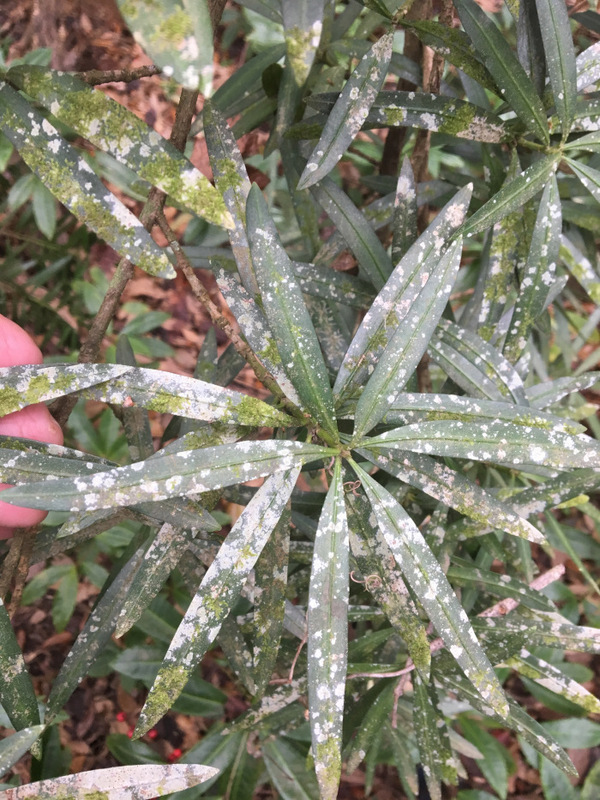 In one particular region of Jungle Gardens, the color differences of newly emerging Podocarpus leaves are particularly dramatic. The most frequent color of new growth is pale green, but some trees display a rich burgundy-red color and still others have bright yellow near white new growth. These differences are unique to individual trees and apparently of a genetic basis. Podocarpus is considered to be a slow-growing tree. Therefore, the presence of large Podocarpus trees growing naturally throughout the forested areas of Jungle Gardens suggests the species has been a part of the local flora for a very long time.